WASHINGTON? U.S. Senate appropriators on Sept. 16 passeda defense spending bill that would put the brakes on the DefenseDepartment'splans to begin development of a new weather satellite constellation in2011. TheSenate Appropriations Committee's version of the 2011Defense Appropriations Bill also added $44 million to the Pentagon's$94million request for the Operationally Responsive Space Office to fundresponsive space launch capabilities. ThePentagon has spent the last few months conceiving anew weathersatelliteprogram after the White House in February dismantled themilitary-civilian National Polar-orbiting Operational EnvironmentalSatelliteSystem (NPOESS) effort. Plans for the new DefenseWeather Satellite System(DWSS) were approved in August by thePentagon's acquisition chief. A new civil weather satellite system isbeingdeveloped by NASA and the National Oceanic and AtmosphericAdministration(NOAA). TheSenate Appropriations Committee provided only $50million of the $325.5 million requested by the Air Force for the DWSSprogram;the bill must still be passed by the full Senate and reconciled with aHouseversion of the bill that has yet to be drafted. With two weeksremaining beforethe beginning of the new fiscal year, Congress has yet to vote on anyof its 12spending bills for 2011. Ascurrently planned, the DWSS satellites will featuretwo instrument packages originally planned for NPOESS: the VisibleInfraredImager Radiometer Suite and the Space Environmental Monitoring sensor.Thesystem will also carry a to-be-determined microwave sensor. NorthropGrumman Aerospace Systems of Redondo Beach,Calif., was the prime contractor for NPOESS, responsible for developingthe satelliteplatform and managing instrument subcontractors and overall systemintegration.The company is now expected to provide satellite platforms for thefirst twoDWSS spacecraft, but whether they will feature the NPOESSdesignhas yet to be determined. TheSenate committee is concerned that the total cost tocomplete both the military and civil weather satellite constellationswillexceed $20 billion, including the roughly $5 billion that was spent onNPOESS.The Pentagon estimates its program will cost nearly $6 billion, and thecivilsystem is expected to cost another $9.4 billion, according to languagein thereport accompanying the bill. Becausethe Air Force still has two legacy DefenseMeteorological Satellite Program spacecraft that have yet to launch,thecommittee declined to fund development of new DWSS constellation. Itprovided$50 million for continued development of military weather satellitesensors. 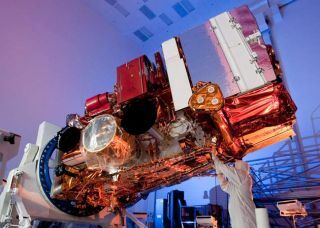 "Whilethe committee understands the importance ofthese satellites and their missions, the committee believes there mustbe amore cost-effective way for [the Defense Department] toutilize NOAA'sinvestment," the committee wrote. "It is premature at this time forthe [Defense Department] to set up a large program office and begin tobuildDWSS." Meanwhile,the new civil weathersatellite program, dubbed the Joint Polar Satellite System, hasreceived moresupport from Congress. The Senate Appropriations Committee on July 22passedits version of the 2011 Commerce, Justice and Science AppropriationsBill,which provided the full $1.06 billion requested for the satelliteprogram byNOAA. The House version of the bill has not yet made it out ofcommittee. NASAis developing the Joint Polar Satellite System onbehalf of NOAA and plans to launch the first satellite in 2014. NASA inSeptember awarded an $82.4 million contract to Ball Aerospace &Technologies Corp. of Boulder, Colo., to build the Ozone Mapping andProfilingSuite for the first satellite. The agency also intends to issue a $214millionsole-source contract to Ball to provide the satellite's platform,according toan Aug. 23 posting on the Federal Business Opportunities website.